Submitted by cosamo_admin on Monday, June 29, 2015 - 16:36. Styling hair without using heat can be tricky. Hot tools come in handy when you wake up with a bad hair day, but like we all already know they are damaging to hair. Today we have a few tricks that you should try out that will help you when you want the look of straight hair but don't feel like using your straightener. If you are someone who uses hot tools on a regular basis you may find it hard to stop but since it is summer it's the perfect time to try! Since it is a lot warmer out you probably don't want to wear your hair down anyways so try out some of these tricks and put your hot tools away for this season! Comb your hair instead of using a blow dryer. 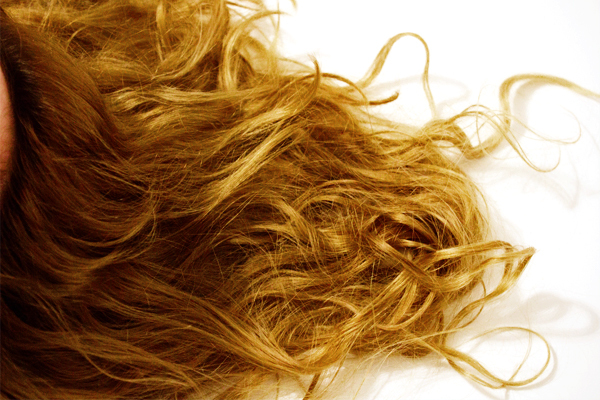 The heat from a blow dryer can eventually make your hair brittle and dry if you are constantly using it. Instead of spending an hour blowing out your hair try just using a comb! When you get out of the shower pat your hair dry with a towel and then comb out any tangles. Keep combing periodically until your hair is fully dry. If you are consistently combing it will help to straighten your hair and reduce the amount of wave. Rinse your hair with cold water. Since it is getting really hot out this trick shouldn't be too hard! After washing your hair with your favorite shampoo and conditioner rinse your hair with cold water. The colder the water the shinier your hair will be! By doing this you will also notice less frizz in your hair, overall making your hair appear a lot straighter. Apply a milk and honey hair mask. Different hair masks can help with different problems your hair might be having. This particular hair mask will help straighten your hair and tame any curls you may have! Start by mixing 1 cup of thick milk with 1 tablespoon of honey. Apply the mask throughout your hair and leave it in for an hour. After just wash your hair like you normally would, we also suggest using a straightening shampoo and conditioner this will also help! Section your hair off with soft hair bands before going to sleep. Before going to bed take some time to put your hair into two low pig tails. We suggest using creaseless hair bands or softer hair bands, this will ensure that you don't wake up with any awkward creases in your hair. This will tame your hair while you sleep, so if you're a rough sleeper and tend to wake up with crazy hair this trick will prevent any frizz! These tricks won't give you naturally straight hair but they will help in controlling messy or frizzy hair overall making your hair a lot smoother! Submitted by cosamo_admin on Friday, June 26, 2015 - 13:24. Getting highlights professionally done at a salon can not only be expensive but super damaging to your hair. It's officially summer time and not only do we want sun-kissed skin but hair too! Today we have a few DIY natural hair highlighters that will cause almost no damage to your hair and your wallet! Keep reading to find out about these all-natural color enhancers that will keep your color looking shiny and bright! Lemon juice is a very common highlighter that will work perfectly in the summer! All you have to do is spray the mixture in your hair before tanning out by the pool for a few hours, when you go back inside your hair will look better than ever! We read that when the citric acid in the lemon juice heats up, your hair cuticles open and lifts out the pigment! Not only does this remedy work but it is so easy to prepare! Start with squeezing some fresh lemon into a bottle and then dilute it with water, you want to use 3 times the amount of lemon juice. All you have to do next is spray the mixture throughout your hair and have a relaxing day by the pool or beach! Chamomile tea is another hair lightener that will develop slower than lemon juice which is better for anyone who is a brunette! Just brew up two cups of chamomile tea, one for your hair the other to sip on! Once it has cooled you can jump into the shower and rinse your hair with the tea. Follow that up with your regular shampoo and conditioner and you will gradually notice a change in your hair color! Honey is not only a natural sweetener it's also a natural alternative to lightening your hair! Honey can also be deeply conditioning so if you already have damaged hair this might help! Honey contains peroxide which is an effective lightener when mixed with distilled water. If you choose to use this remedy your hair will look lighter, feel softer, and smell delicious! This might sound shocking but beer is another ingredient you can use to lighten your hair for the summer! The key is to rinse your hair with a light beer. The B vitamins and proteins that are found in beer will also help to repair any damage your hair may already have! Make sure that you wash your hair after applying the beer and you are good to go! Make sure that you are keeping up with any of these natural lighteners to see the best results! Submitted by cosamo_admin on Wednesday, June 24, 2015 - 16:44.